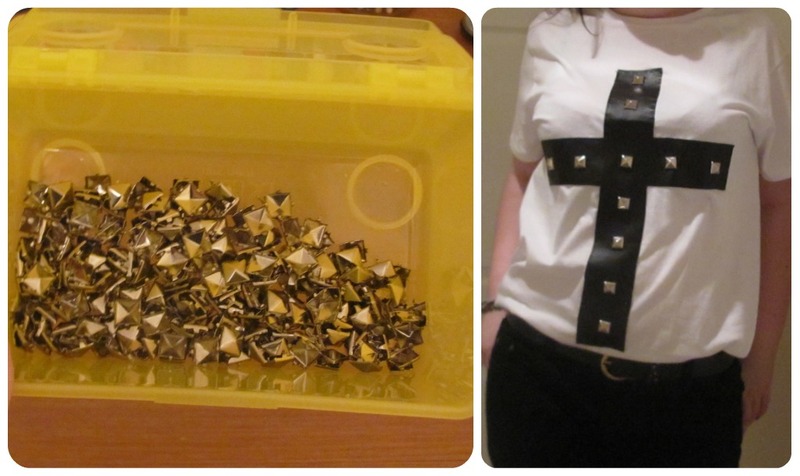 Studded t-shirt diy | S J M W E L L - Fashion, Beauty & Lifestyle blog. I'm currently blogging while in hair roller's, oh how glamourous. After seeing jessica's post on sunday I attempted to have another go at trying it, last time wasn't the greatest! I've been wanting to do this d.i.y for age's so when I went shopping I made sure to pick up quite a few t-shirt's (I have a few planned!) I had some leather left over from my art coursework and thankfully it fitted just right. I used accurate measurement's ruler and all, check me out! and marked them with chalk, if you don't have the special dressmaking chalk then normal white chalk does the job fine, it doesn't mark like a pencil and it rub's off very easily. 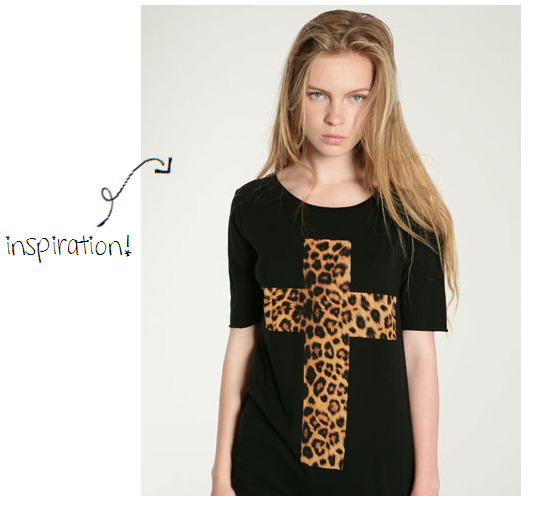 Use sharp scissor's to cut the leather and with pin's fix the cross on the shirt. I handstitched mine because a few month's ago i sold my sewing machine and have yet to buy a new one (cry.) It took me about 3hour's in all and i certainly had arm ache and back ache by the end of it. I originally wanted to put all mini stud's around the edge but realising it would take me about 3 year's to complete i made a cross in the middle. I know in the photo it look's like there is a huge gap in between them at the top but there isn't... honest! After hurting my finger's by piercing the shirt and the leather the stud's finally went through ok. I'll most probably wear a vest under the shirt it's quite see through. I'll be making more but maybe with different shapes! Great DIY, it turned out wonderful! !